Caerleon has a number of petanque playing pubs and clubs. This website shows you where they are and how to get in touch with them. It shows you who has got serious teams, who plays for fun and where you can go to learn or just have a game. 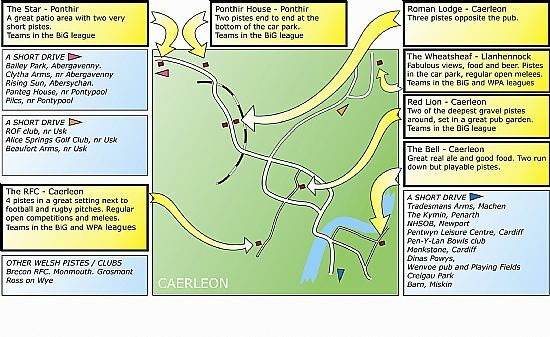 Come to Caerleon and enjoy a game. If you want to add information about your club you can use the feedback form and we will update the site as soon as possible. This site is run to help promote petanque (boules) in the local Caerleon area. You will also find, in the near future, information about other clubs that are close by. So if you are on your hols or live in the local area and fancy a game of boules you should be able to find a suitable place to play on this site.